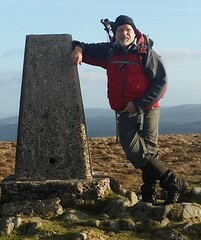 With two weeks holiday booked over the Easter break, where else would I go but Dartmoor? Let's face it, this is the reason I moved here! It was all going according to plan, the long range weather forecast was encouraging and I had high hopes of visiting many new tors, in addition to a few old friends. First up would be a visit to the only tor on my list that had an admission fee. 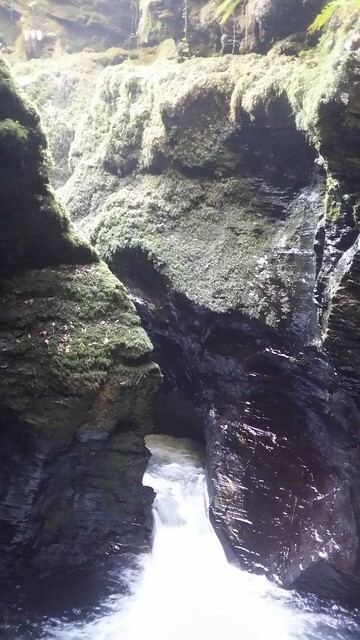 Ravens Tor isn't the attraction that requires you to hand over money, it just happens to lie within the popular National Trust owned Lydford Gorge. I arrived an hour early, parking at the White Lady Waterfalls car park, with the intention of trying to find the owner of Was Tor. This small outcrop lies on private land and its location being in full view of the houses below has stopped me from jumping the gate on this one. 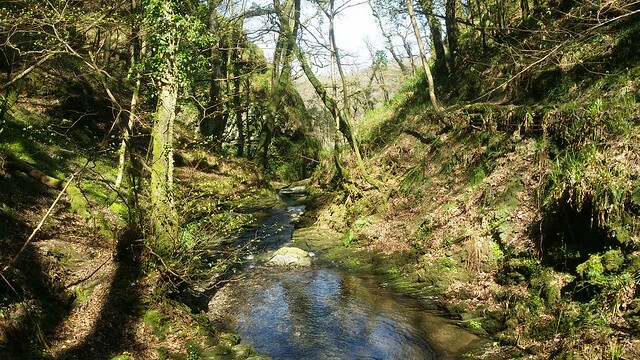 More on this in another post, let us concentrate on Lydford Gorge. 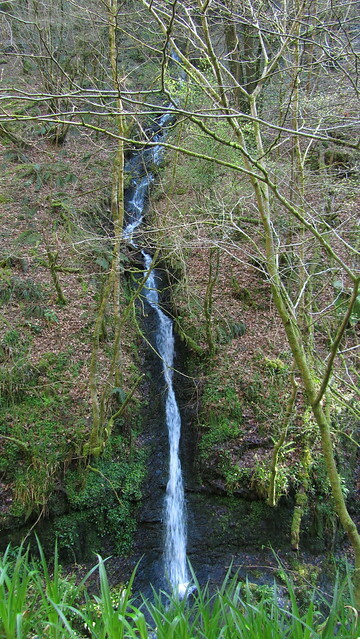 I was first into the gorge, I think going from the lower entrance gave me a head start on the crowds, so when I had descended to White Lady Waterfall, via the gentler gradient, rather than the alternative steps, I had her all to myself! 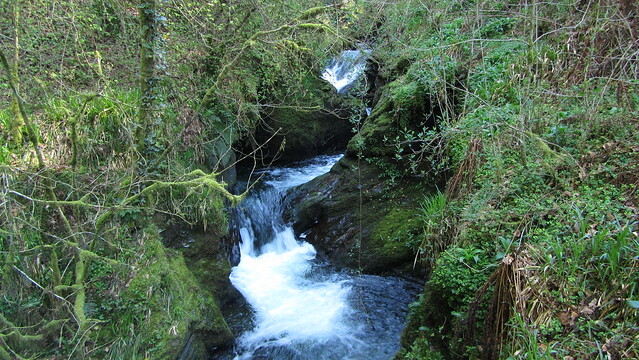 The Burn, from its source on the lower slopes of Black Down, below Gibbett Hill, has no time to form into a major river. 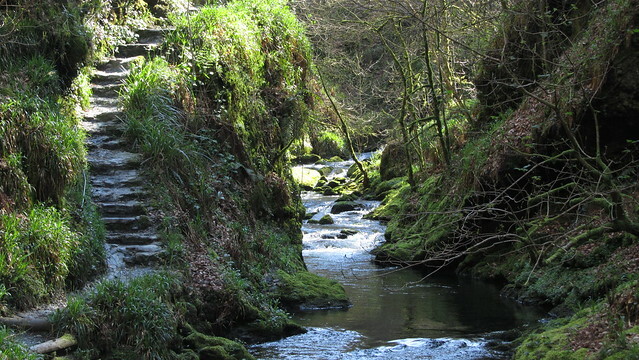 It can't travel much more than a mile before it meets the precipice and tumbles dramatically to join the River Lyd. The rivers loss is our gain! I crossed the bridge over the Lyd. 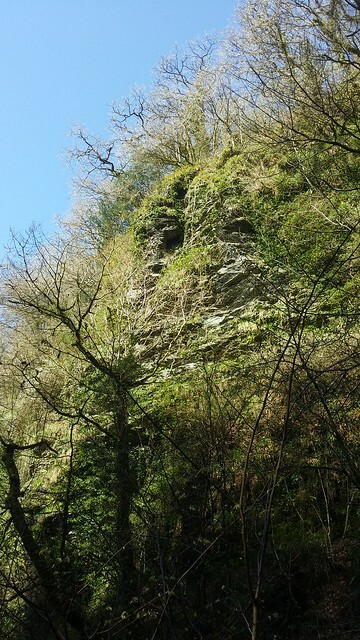 The majority of the walk down in the gorge remains on this side, hugging the steep cliffs. I haven't been back here since April 2007, a whole ten years! I don't remember the path being so hazardous but I think that is more down to my age than actually being the case. 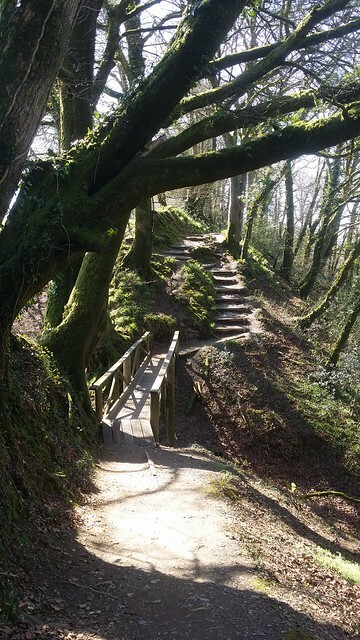 A need for footwear with a good tread and use of the handrails is a must. The gorge has a new attraction, and a reminder that the landscape is still changing. 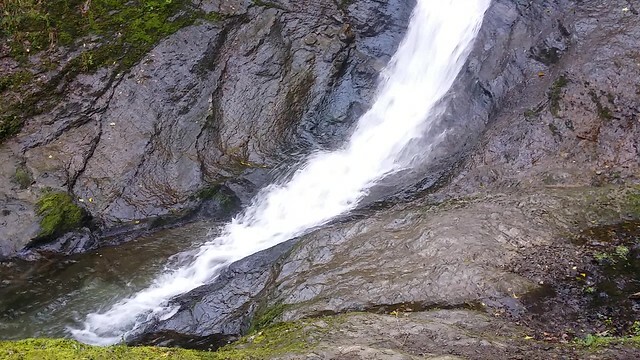 Just before Tunnel Falls, there is a huge landslide, that occurred earlier in 2017. 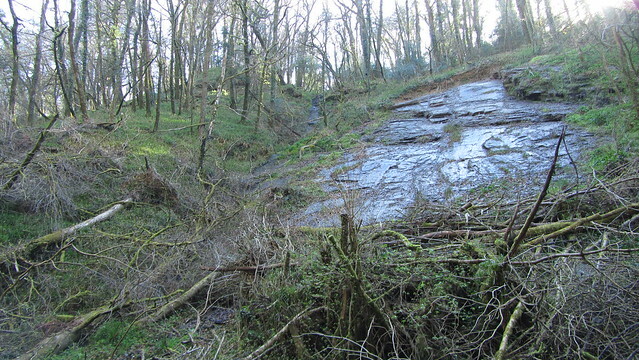 A hastily erected sign goes on to explain how, on the 26 January; "The landslide is a typical example of large planar sliding failure; meaning the rock forms a steep, flat surface. This is lubricated by rainwater seeping through the soil to the rock forming its own little streams under the soil. All the soil and rock then slides down the slippery slope." I was enjoying the walk so much I forgot to look out for Raven's Tor. 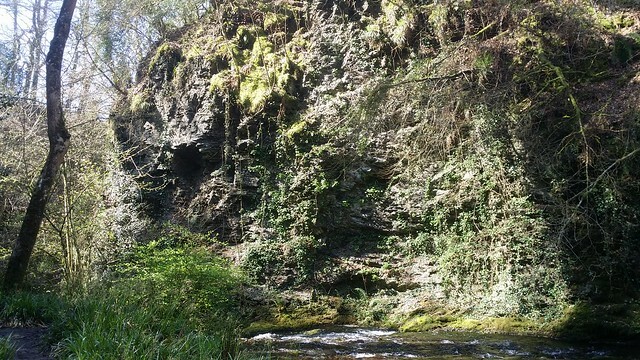 It wasn't until I looked at my phone for the time, I noticed on my Memory Map app that I had missed it back by Tunnel Falls, I turned back, breaking the protocols of the one way system and, as sod's law dictates, encountered other visitors for the first time on the narrow ledge! Back through the tunnel, I got a good view of Raven's Tor. 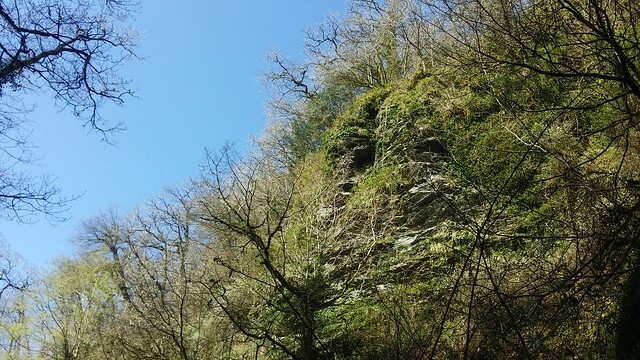 This is the closest you can get to the outcrop, any inclination of an approach from the private woodland at the top would be foolhardy. I was happy to claim it as a bag from here. The sun was high now and getting into the gorge, it was warming up. 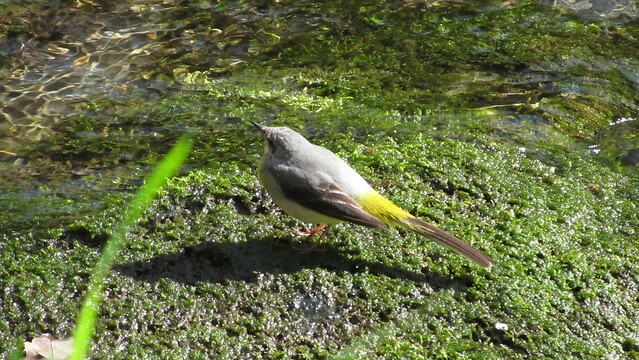 A pair of yellow wagtails were enjoying themselves, darting about the river. 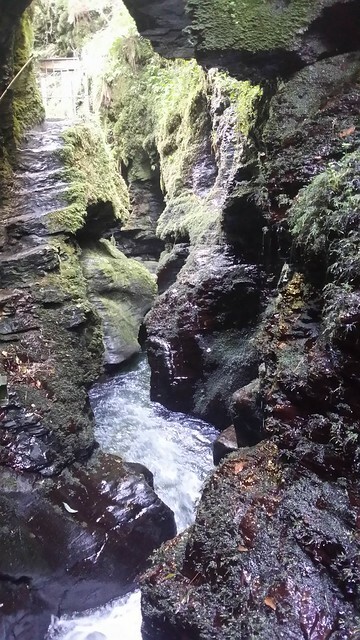 I came to the Devil's Cauldron, a side path from the main route, one which can be unnerving with the rushing water beneath and no barrier from the edge. Once on the metal platform, you can enjoy the power of the river and ignore the fact you'll have to return the same way for a few moments! 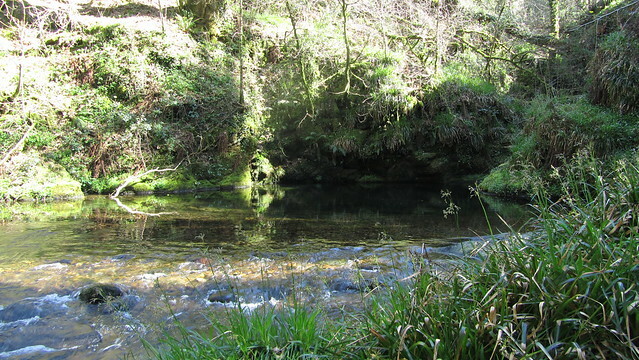 I don't remember visiting Tucker's Pool last time I was here, but looking back at old photographs, I obviously did! 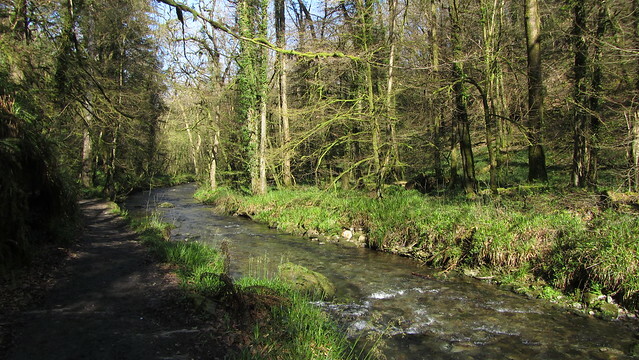 This section extends under the road bridge and up the Lyd a quarter of a mile to an idyllic spot. 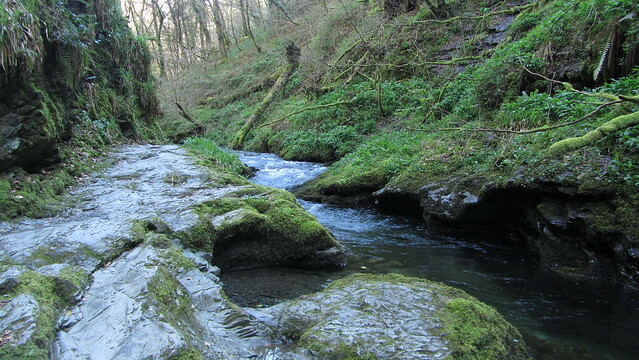 It's a world away from the turmoil and noise of the cauldron downstream. With the surrounding rock faces bright in the sunshine, I won't forget it next time! I returned the same route, then climbed out of the gorge to the main entrance. 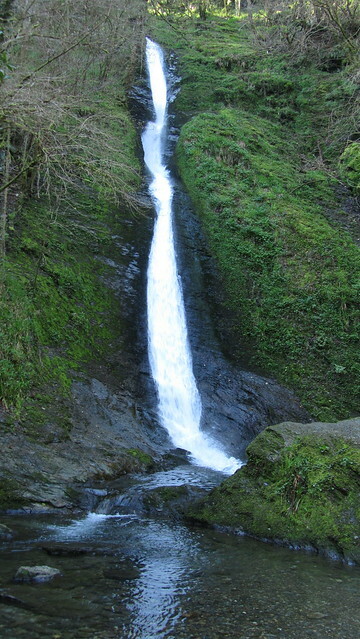 Turning right, I followed the high path back towards White Lady Waterfall. Here, I encountered more people. 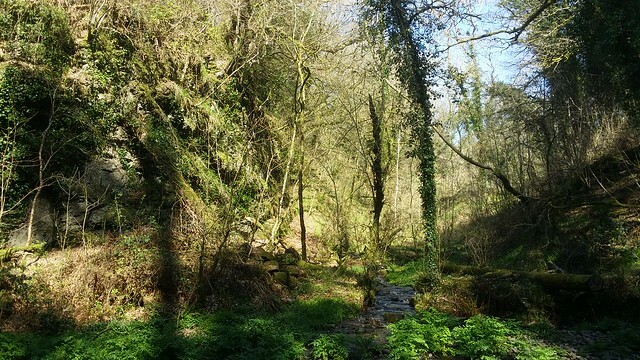 Gone midday, the holidaymakers had by now gathered their children and ventured forth into the countryside on a beautiful day! Despite the increase, it was still possible to have sections of tranquility here. However, looking down to the path at the bottom, I could see more on the route, and I was pretty smug that I had opted for an early start. 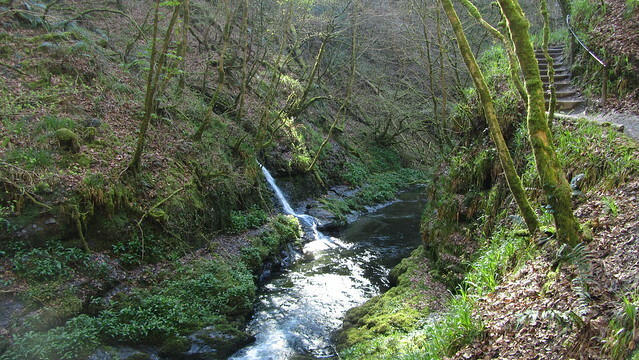 For more information on Lydford Gorge; opening times etc. 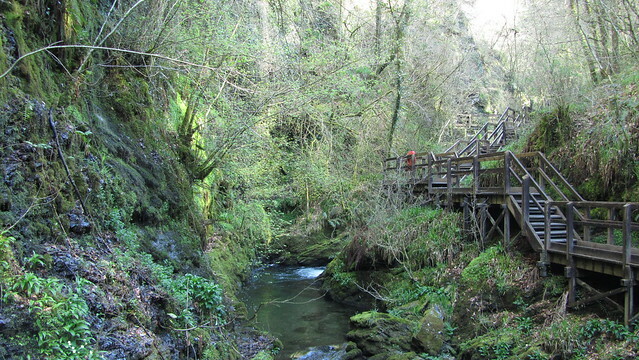 be sure to visit their website at https://www.nationaltrust.org.uk/lydford-gorge.